Wins for Heart of Midlothian and Glasgow Girls as Hamilton keep looking for their first win of the season. Title favourites Heart of Midlothian beat Hutchison Vale 9–0, last year's runners-up F.C. Kilmarnock had to settle for a draw with newly-promoted Dundee United, Partick Thistle drew 1–1 with Hamilton Academical, while Glasgow Girls won 2–0 against St Johnstone. Hearts picked up their second consecutive win with a thumping 9–0 victory at home against Hutchison Vale. New signing Caroline Heron opened the scoring in the 11th minute with a right-footed shot into the right-hand corner of the net. She then added her second in the 29th minute with a header, after the Vale defence failed to clear a cross into the box. Lauren Evans netted the third goal in the 31st minute, and Claire Delworth made it 4–0 less than one minute later. 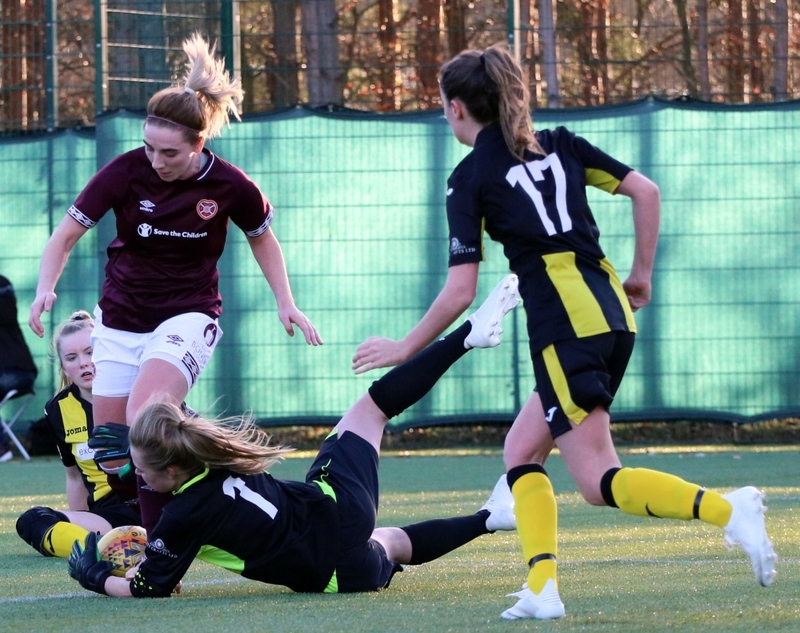 Ashley Carse scored Hearts' fifth goal with a lob over the Vale goalkeeper in the 39th minute, and she scored her second just four minutes later with a header from close range. The seventh goal came in the 48th minute through Mariel Kaney, who slotted the ball home following a great run from Evans. Danni Pagliarulo converted a penalty – her second in two games – in the 69th minute, and Carse completed her hat-trick six minutes later with another finish from close range. Kilmarnock broke the deadlock in the first half through Lisa Swanson, who made space for herself before finishing with her left foot. The hosts were denied the opportunity to score a second goal a few minutes later, when midfielder Clare Docherty was brought down in the box and the referee decided not to award a penalty. Despite numerous chances in the second half, Kilmarnock were unable to add a second goal, and Dundee United eventually equalised in the 85th minute, when a free-kick hit the crossbar and came down to Taylor Brackin, who tapped it in to make it 1–1. The visitors took the lead after just three minutes, when Leeanne Hughes gave the ball away and Kirstie McIntosh played in Dionne Brown, who slotted it in past Nicolle Andrews. Partick Thistle found the equaliser in the 47th minute, when goalkeeper Lauren Grant spilled the ball and Mhairi Hawksworth was on hand to knock it into the empty net. Hamilton had several chances to take the lead in the second half, but the hosts managed to hold on for a deserved point. Eleanor Smith broke the deadlock for Glasgow Girls in the 20th minute, when she knocked the ball home from close range after a corner swung into the box. Lauren Coleman doubled the visitors' lead in the 75th minute, wrapping up the three points for her side, who are currently sitting second on the table with four points.